IMGP5381.JPG, originally uploaded by Daddy Shawn. Don't let him fool you. This guy has been up every other hour for the past two nights. workit, originally uploaded by lisabagg. We can't forget Big Brother's adventures with the new baby's arrival. While we got settled, Finn spent more time with his gorgeous girlfriends. 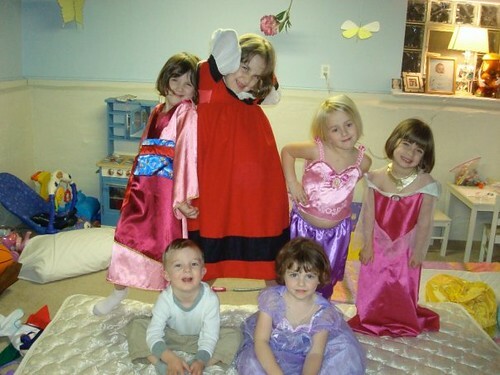 Here he is at Lisa Jones' house, where I'm told he was tasked with judging a fashion show performed by (from left) Maia, Avery, Emma, Regan, and Delilah. I can only assume that Finn's comments were similar to Michael Kors on Project Runway. Something like, "Delilah, what were you going for? The 80s prom look?" Poor Cormac already has the second child syndrome--I have barely had any time to update the blog with his adorable photos and anecdotes. Last week was a wild week of adjusting to our new addition, and then attending to some urgent baby issues. All is well, it just seems kind of annoying now in retrospect. First, the drama: Cormac was born tongue-tied, which meant the nursing wasn't going well for either one of us. We needed to have a surgical procedure done to fix this. Insurance was denying our referral because he was not yet "in their system," which takes 5-7 business days to do. The child was not yet 5-7 days old. If you'll pardon my language, I can't tell you how much this pissed me off. So, once we broke through the red tape to get the procedure done, he sure wasn't going back to breastfeeding after enjoying the easy life of the bottle for the week. Thanks a lot, Blue Cross/Blue Shield. Since then, I've been pumping and trying to get him back to breastfeeding, which is very time-consuming. Not to mention, pumpin' ain't easy. Otherwise, Cormac is doing great. He's got Ceasarian good looks, although he was born the old-fashioned way. (Birth story to come soon.) I'm proud to report that his head and neck strength is at least that of a three-week old. He is feeding, pooping, and peeing with vigor. (And I do mean vigor---I'll spare you the details on the latter two.) He's snuggly and small, alert and calm. His likes include being held, warm milk, swaddling, and staring inquisitively at contrasting colors. His dislikes include diaper changes, clothing changes, and bathtime. And when you don't hurry up already with the milk. Everyone wants to know how Finn is doing with all this. Honestly, the first weekend was a little rocky. He was crying a lot, and there were some tantrums. But now, I have to say he's adjusting really well. The first thing he does each morning is go wash his hands so he can see baby. He kisses him, helps me with feeding and changing, and keeps telling us how "cute baby is." Don't get me wrong, Finn's still three. But he's been absolutely kind and loving to his baby brother, which is beautiful to see. In fact, last night, he said, "Mommy? Daddy? I looooove baby brother. Can he stay? Forever and ever?" Yes, he can. It may be partly because this is the exact same tub, but these shots of Cormac's first bath are eerily reminiscent of the same moment just over 3 years ago with Finn. I thought this day would never get here! 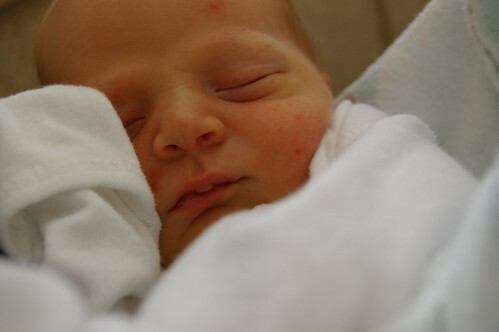 But I'm happy to announce the arrival of our little bundle--Cormac Peter Hazen last Thursday, November 6th. He's 7lbs., 10oz., and looks pretty much EXACTLY like his big brother. He was kind enough to arrive with little drama---mom only ended up pushing for about 20 minutes. And he's eating, sleeping, pooping, and occasionally crying up a storm so far. In terms of names, we came down to three--Miles (Milo) if he had dark hair, Emmett if he was bald, and Cormac if he was a blondie. While he isn't totally blonde, he definitely looks like he'll be a fair-haired Irish lad. So that sealed the deal. We're finally home from the hospital, and I'll have time to write up his birth story soon. But all is well so far and his big brother is even excited. (So far.) More soon. And many more photos! As I am just about ready to pop out this kid, so I wanted to update everyone with some of my recent work before I duck out for a couple weeks. My most recent site launch is a redesign for Studio Lotus, an Atlanta-based Pilates studio. The owner came to me because her site had outgrown its existing design. The 50+ page site needed a structure designed that would appeal to new customers, existing clients, and teachers looking to bolster existing education. Using her existing collateral as a basis for the redesign, I better adapted her palette to the new design, and redesigned the interface with drop-down menus to help users better navigate the site. I also created a site for DJ Anderson, a Bay Area-based career and life coach. (And an old sorority sister of mine!) With this site, DJ wanted to create a look that was distinctive and stood apart from other coaching sites. (During our research, we found that there are far too many life coach sites with rainbows and bursts of light.) We used a refined palette that was soft enough for individuals, but sophisticated enough for corporations. And we used the visual metaphor of stacked rocks to indicate that with DJ, the person would be on the right path. Fringe Home Design was a collaboration with another Chicago-based designer, Amanda Mans of Blueprint Design Group. Amanda created the design for the site for this Oak Park, IL based interior design business, and I built out the site. I loved bringing Amanda's designs to life. Lastly, the redesign for Guiding Hands School came to me through my trusted programmer, Kim Flournoy. She had been hired to build the school's site, all they needed was a designer. After working with their team, we came up with a colorful palette that showed the diversity of the children and programs the school offered, along with a structure that makes it easy to find a variety of information. Don't forget about me while I'm on maternity leave! IMGP5077.JPG, originally uploaded by Daddy Shawn. Yes, we did!!! I'm thrilled. Don't worry, Baby Hazen! It's OK to come out now! DSC00232.JPG, originally uploaded by lisabagg. If you're wondering what we need for the new baby, there's one crucial item that has been on the registry for a while now. 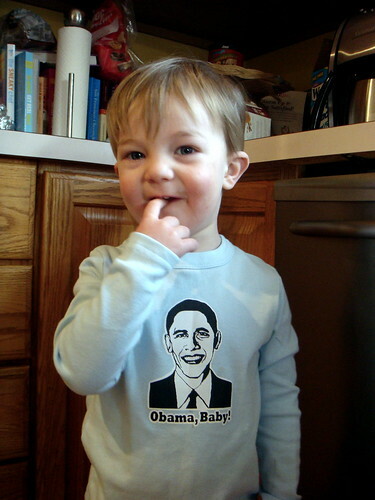 Mama desperately needs a new president, and I'm talking new. Not one who supports this BS Iraq war, that (at this rate), my boys will be fighting in. One who believes health care should be available and a right to every single American. A president who believes that Americans are not just citizens of their own country, but citizens of the world. Someone who believes that investment in alternative energy is essential for our future. A leader who governs with a cool hand and sound judgment. It was a gorgeous Halloween day--all the way up to 70 degrees. This is seriously the best time of year if you have a kid. Finn had an absolute blast, and insisted on decorating his own face with facepaint. 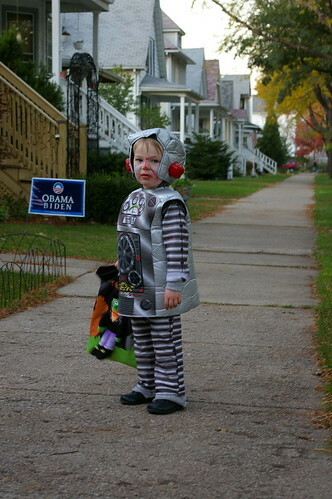 But his favorite part was when he gave out candy at our house.